Mitochondria are batted about as a common target of influence for integrative practitioners. However, many clinicians view this organelle as a bit of a black box. What follows is a clinician-oriented overview of the energy-producing centers in the human cell. All cells have internal components called organelles. An organelle is defined as a specialized part of a cell having a specific function. A well-known organelle is the nucleus which contains information for the cell to function and survive. All of the organelles are suspended in a matrix called cytoplasm. Mitochondria (singular: mitochondrion) are the organelles responsible for turning food and oxygen into energy. Since some cells require more energy than others based on the specialization of tissue that they belong, the form and number of mitochondria differ from cell to cell. For example, the tail of a sperm contains many mitochondria and they run in a spiral form along the length of the tail. Heart muscle cells have 40% of the cytoplasm taken up by mitochondria while liver cell cytoplasm is 20-15% mitochondria which ends up being 1,000 to 2,000 mitochondria per cell. Illustrations in textbooks often give us the impression of only a few mitochondria per cell. All cells except mature red blood cells have mitochondria. Besides just pumping out energy, mitochondria also store calcium ions and influence membrane potentials, initiate cell death (apoptosis), and have some involvement with steroid hormones. Integrative practitioners often wonder what can influence the health and function of mitochondria and while not an exhaustive list, several mechanisms have been identified that offer this influence. Mitochondrial biogenesis is the generation of new mitochondria. Normal aging slows the process of mitochondrial biogenesis. On the flip side is the protection/ retention of mitochondrial from death channel. This so-called “death channel” is the ultimate demise of a mitochondrion. Alternations of the function of the electron transport chain (ETC) can be identified to optimize adenosine triphosphate (ATP) production. Improving general cellular health supports mitochondria as the cytoplasm is the soup in which these organelles live. The mitochondrial cell membrane can be supported directly or indirectly but providing adequate building blocks or protecting the mitochondria membrane or both. Speaking of membranes, maintenance of the electrical and chemical transmembrane potential of the inner membrane is necessary to optimize mitochondrial function. 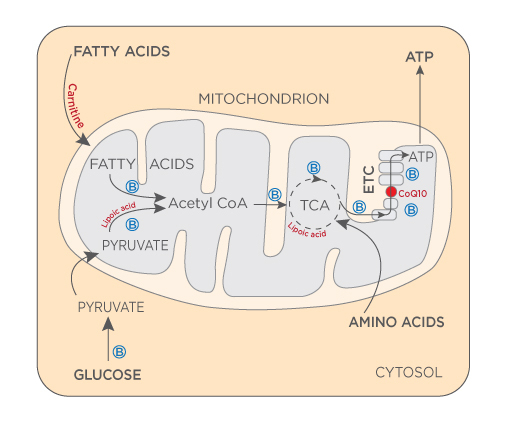 Transport of the critical metabolites into mitochondria as well as out of the mitochondria plays a role in optimal function as does cell function signaling and differentiation. Apoptosis control and cell cycle and growth influence mitochondria as these are energy dependent processes. One theory is that mitochondria arose over a billion years ago from bacteria being engulfed by a eukaryotic cell. A eukaryotic cell is a cell with a nucleus enclosed in a membrane as well as having other membrane-bound organelles. Technically, energy is neither created nor destroyed according to the Second Law of Thermodynamics, but humans certainly know when they have enough as well as when they do not. The output of mitochondria is ATP, known as the currency of energy within cells. The name implies that there are 3 phosphate groups attached to the molecule. When a phosphate is cleaved off, a massive amount of energy is released and it drives biochemical reactions. Glycolysis, the Kreb’s cycle, and the Electron Transport Chain are three major steps to cellular respiration. Minerals, vitamins, and coenzymes support these processes. 1 Huskisson E, Maggini S, Ruf M. The role of vitamins and minerals in energy metabolism and well-being. J Int Med Res. 2007 May-Jun;35(3):277-89.